You won’t want to miss this dazzling evening kick-off to the Fair weekend! This festive and highly anticipated evening highlights the very best of the best in 10 art categories and showcases the energy, creativity, and skills of our exhibiting Fair artists. You won’t want to miss seeing these breathtaking creations up close and congratulating the artists. You will also enjoy previewing a stunning array of “must have” fashions designed by Fair artists, bidding on exciting artworks and more during our silent auction, and relaxing with old and new friends while enjoying hors d’oeuvres, dessert and beverages. Visit the Fair Tickets page to purchase tickets. Each year, many of our Fair artists submit their best work to compete for a coveted Heard Museum Guild Indian Fair & Market award ribbon and prize money. A renowned group of judges, composed of artists, collectors, and museum professionals, review and rate each submitted piece. The winning artwork is displayed during the Best of Show evening. 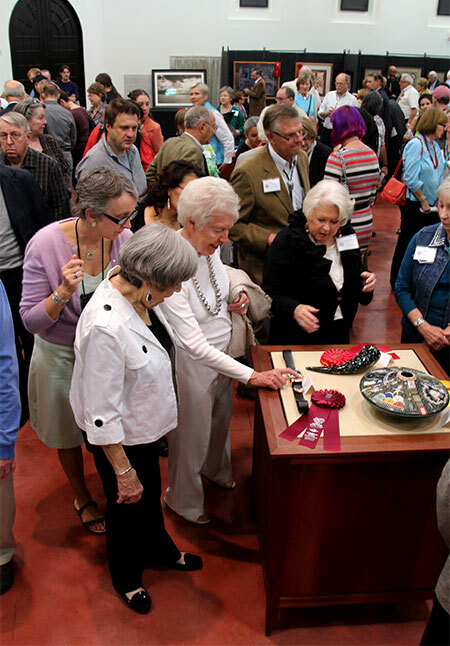 Award categories include Jewelry and Lapidary; Pottery; Paintings, Photography, and Graphics; Pueblo Carvings; Sculpture; Textiles and Weaving; Diverse Arts; Baskets; Personal Attire; and Beadwork and Quillwork. In all, 149 ribbons are awarded including overall Best of Show; Best of Classification, Innovation, 1st Place in Division, 2nd Place in Division; Judges Choice; and one special award, Conrad House Cutting-Edge Award. In honor of the 60th Annual Indian Fair & Market, we are delighted to announce a one-time, special $10,000 Best of Show Award \ sponsored by Howard R. & Joy M. Berlin and Kristine & Leland W. Peterson. Peterson is Treasurer of the Heard Museum Board of Trustees and Berlin is a Life Trustee of the Heard Museum. The Guild thanks the Berlins and Petersons for their generous support of the Indian Fair & Market and our outstanding artists. Join the fun and encourage friendly competition with your family and friends for fabulous items donated by our Fair artists and friends of the Heard Museum! Items will be on view throughout the evening. The auction is being conducted online, so anyone can bid from anywhere at any time on a mobile phone. 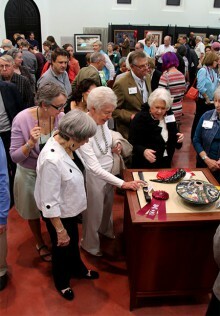 Guests admiring submissions to the Juried Competition during a past Indian Fair & Market Best of Show Reception.